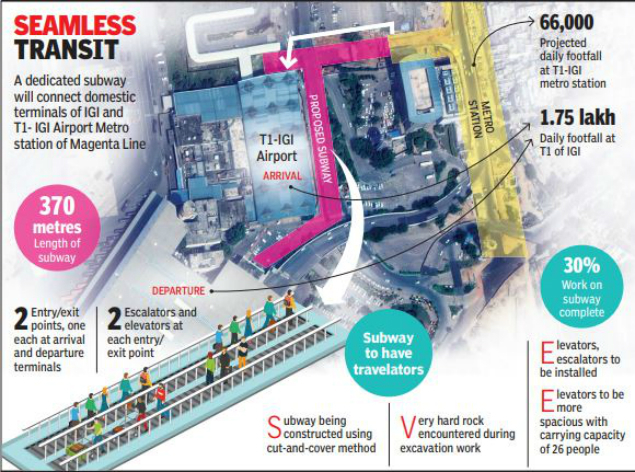 From May 2019, commuters taking the metro to reach the domestic terminals of the Indira Gandhi International Airport won’t have to trek the distance from the station on foot. The Delhi Metro Rail Corporation is constructing a 370-metre-long subway, which will seamlessly connect Terminal 1-IGI Airport Metro station of Magenta Line with the domestic terminals. Apart from abundant escalators and elevators, the subway will also boast of travelators so that passengers don’t have to walk the distance. This will be the first subway in the city to have travelators.